Flowers are beautiful, of course, but part of the charm of Washington Square Park is the ways in which you’d connect with others there. There will now be impediments to that. And it doesn’t feel like you would want to stroll through, it feels like a passageway. Of course, it’s not done yet. Which brings me to the information I was told by City Council Member Alan Gerson at the City Council Parks Department Budget Hearing. He mentioned that Manhattan Community Board 2 has some say in some of the design (not the things most of us would like to see changed, but still) but they have not met to discuss it. He wasn’t sure why. The work at Washington Square Park is proceeding and the Community Board hasn’t met to discuss it … do they think the Parks Department is waiting for their input? J. Bary, who took this photo and has been photographing the work there, says there’s trees being dropped in around the new fountain location but – if so – I haven’t noticed them. It’s possible that they are mostly visible from high up – where he is taking his photos from. It’s also probable that I focus so intently on the hole in the ground where the “aligned” fountain is supposed to appear that I’ve missed them. Please say it isn’t so — Mayor Bloomberg seeking third term? What could Mayor Bloomberg’s “unfinished agenda” be? Let’s see… thus far he is responsible for expanding privatization of our public spaces, cutting down large swaths of trees in our city parks, endless “development” of luxury housing, making NYC un-affordable to many, extending a climate where corporations and Wall Street rule, endless “testing” of children in schools, etc. etc. He has had some assistance in “overcoming long political odds” over the years by publications like The New York Times which so rarely hold him to true task on anything. 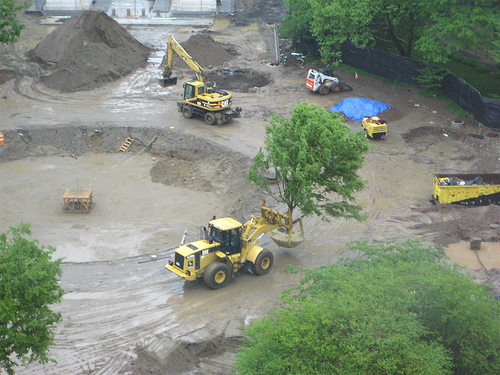 Mayor Bloomberg’s fingerprints extend to the dramatic changes at – and bulldozing of – Washington Square Park, the desire to privatize and reduce public space at Union Square Park, Yankee Stadium‘s destruction of two Bronx parks, Randalls Island’s privatization leading to destruction of wildlife and natural habitat. There’s more. But the pattern is overall privatization and pacification of New York City’s public spaces. The mayor’s current term is set to expire on Dec. 31, 2009. *note: A photo of Mayor Bloomberg tossing a tree into a chipper would not load, for some unknown reason, but hopefully later a photo will appear with this post.